An other problem is when the second layer does not stick to the in this case perfect first layer. This is a sign of too much material coming out that does not find the way down (or filament not hot enough). While printing, the layer can be saved by swiping the hot strings with a finger down (don't burn your fingers on the extruder). If the consequent layers do not have a problem anymore then the z-axis zero position should be re-adjusted (by the slicer or the Z-axis stop). 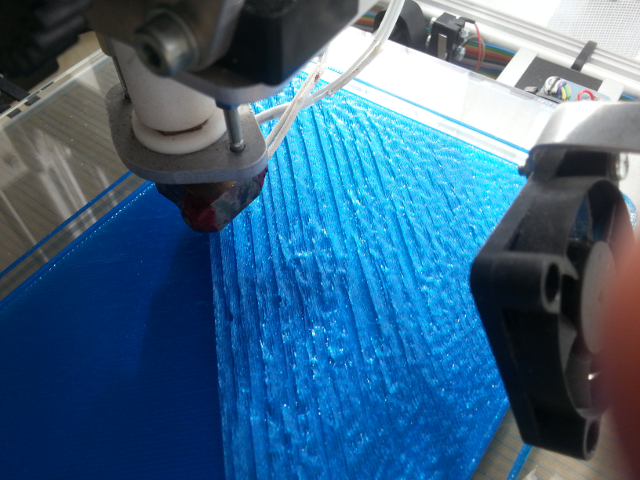 If the other layers have the same problem then the filament diameter setting in the slicer need to be made larger.